UKIP’s Nigel Farage has caused outrage after he Engsplained to a Republican rally in Jackson, Mississippi, with the former banker telling a crowd of 15,000 workers to get their “walking boots on” and do the campaigning for billionaire tycoon Trump, as part of his prize for winning the reality TV show Donald Trump’s British Best Friend. During a ten minute speech, part of his winnings that also include $12,000,000 in bearer bonds and a week long vacation with Trump at his Mar-a-Lago estate, Farage took credit for the Brexit vote, told activists that he wouldn’t vote for Hillary Clinton “if she blew” him and said that the party could “beat the Polish” by turning around the flagging campaign. But despite leading his diatribe by claiming he had a “message of hope and optimism” regarding the man who bans people based on race and sees giant walls as answers, Farage has been criticised by pundits and users of social media for Engsplaining to an American audience, many of whom dubbed him “King George Farage” in a scathing hashtag. The impression that Farage was Engsplaining was only exacerbated when he claimed in a radio interview prior to the speech that “most Americans haven’t even heard of Romania” and that the US was “copying” the “people’s revolution” that he’d started in the UK. Farage displayed his passport prior to the speech, making him “more constitutional than President Obama”. Members of the public had their say too, with TheRealBennyFranklin45 tweeting: “Kinda like in Star Wars when they’re all planning to attack the Death Star, only if Darth Vader stood up at the back and was like ‘yeah, dawg’ #FarageFrenchName”, while members of Farage’s own party showed dissent too as MP Douglas Carswell said his departing leader was “making a second arse”. 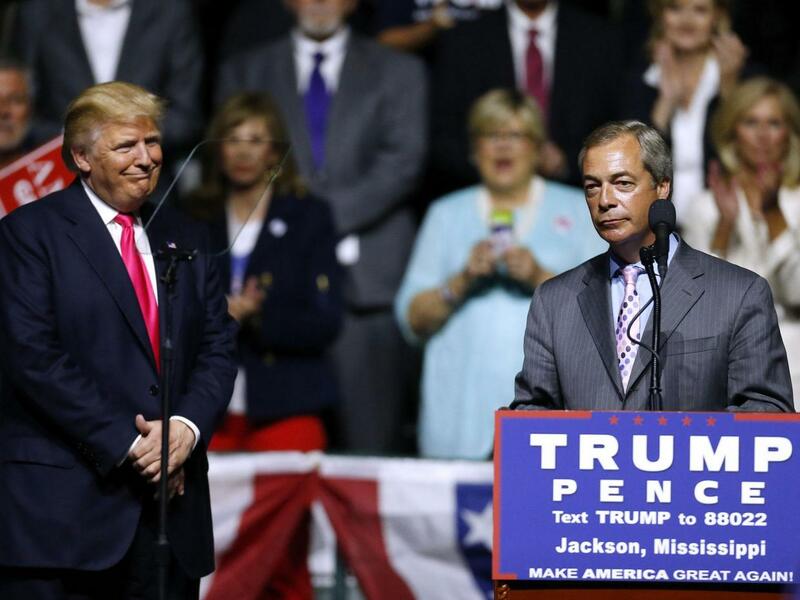 Farage secured the platform after winning the celebrity edition of reality TV show Donald Trump’s British Best Friend, broadcast on ITV2 over the summer, after showing “greater class, character and winnerness” than his opponents, who included Dean Gaffney, Kelvin McKenzie and Dappy. Having impressed the judges on the programme, Farage received a glowing commendation from Trump in the season finale, in which he was described as having “the dignity of Alfred the Butler and the sophistication of James Bond”, before being taken to the United States in Trump’s helicarrier and exposed to the American public. And following the function, Trump insisted that their friendship was not politically motivated or opportunistic, telling the press: “People say I’m fickle, to those people I have just one word: lawsuit. I’m not fickle, I have been married three times which shows I’m committed to marriage, and I’ve started thousands of businesses, which shows I’m committed to business, I’m the committer.